I've been wanting to combine these 2 DSP's with this lovely stamp for a couple days, and it fit in perfectly with this Monday's challenge! 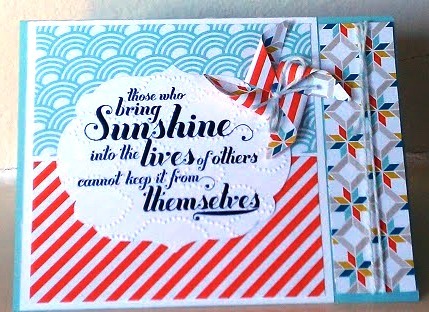 I decided to try sending the stamped image through an embossing folder and I think it worked! And that pinwheel die is honestly the best five bucks I've ever spent. I love it. I love this card. The colors are great and the pinwheel is just adorable!